The control antigen is the peptide used to immunize the animal (immunizing peptide). All polyclonal antibodies are shipped with the control antigen at no extra cost. It’s the “clear vial” you receive with the antibody. Prior to releasing new lots of an antibody, our dedicated in-house staff performs appropriate experiments to ascertain that the new lot is as specific as the previous lot using the control antigen. Since it is highly probable that you have a different experimental setup, we provide you with the experimental tools to also determine the specificity of the antibody in your lab. Using the control antigen is quite simple. After calibrating the conditions under which the antibody works, you can run a side by side experiment. Incubate the antibody in parallel with and without the antigen (the ratio of antibody/antigen is available in the Certificate of Analysis delivered with the antibody) in a small volume (500 µl of 1% BSA in PBS or 3% skim milk) for 1 hour at room temperature with rotation. After the incubation time, dilute each vial to the desired working dilution with the buffer you use and apply it to the membranes for parallel experiments. 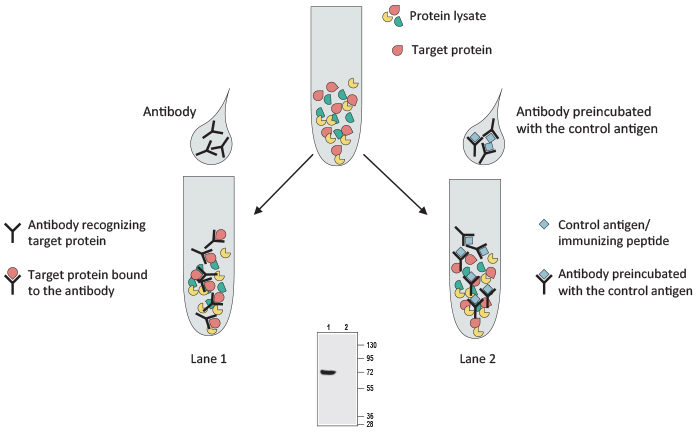 Compare the results of the antibody alone versus the antibody with the antigen. The disappearance of the requested band will confirm the specificity of the antibody. How do YOU use the control antigen? Figure 1. Expression of P2X7 receptor in mouse and human hippocampus.Western blot analysis of mouse (upper panels) and human (lower panels) hippocampal lysates using Anti-P2X7 Receptor Antibody (#APR-004). In both species tested, P2X7 receptor is clearly detected. 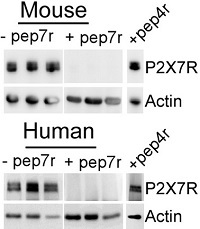 In samples probed with the antibody preincubated with the control antigen (right upper and lower panels), no signal is observed for P2X7 receptor, showing that the antibody specifically detects P2X7. In an additional control experiment, Anti-P2X7 Receptor Antibody is preincubated with the Anti-P2X4 Receptor Antibody (#APR-002) control antigen. As observed, the control antigen for the P2X4 antibody does not block the Anti-P2X7 Receptor Antibody.Adapted from Jimenez-Pacheco, A. et al. (2016) J. Neurosci. 36, 5920 with permission of the Society for Neuroscience. Figure 2. Expression of TRPV4 in mouse kidney cell line.Immunocytochemical staining of mouse mCCDcl1 kidney cells using Anti-TRPV4 Antibody (#ACC-034), (green). TRPV4 staining is completely abolished when the antibody is preincubated with the control antigen (right panels).Adapted from Li, Y. et al. (2016) PLoS ONE 11, e0155006 with permission of PLoS. Figure 3. Expression of KISS1 receptor in various human cells lines.Western blot analysis of human plasmacytoma (INA-6) cells, human mesenchymal stem cell (MSC), and human breast cancer cell lysates using Anti-KISS1 Receptor (extracellular) Antibody (#AKR-001), (upper panels). The band observed is completely eradicated when the antibody is preincubated with the control antigen.Adapted from Dotterweich, J. et al. (2016) PLoS ONE 11, e0155087 with permission of PLoS. Figure 4. Expression of CaV2.3 channel in mouse accessory olfactory bulb.Immunohistochemical staining of mouse accessory olfactory bulb sections using Anti-CaV2.3 (CACNA1E) Antibody (#ACC-006). A(i). CaV2.3 staining (green) is detected in mitral cells. A(ii). High-magnification of (i). A(iii). Note the absence of immunofluorescent staining when the antibody is preincubated with the control antigen.Adapted from Gorin, M. et al. (2016) J. Neurosci. 36, 3127 with permission of the Society for Neuroscience. Figure 5. Expression of NaV1.6 in mouse VNO.Immunohistochemical staining of mouse vomeronasal organ (VNO) sections using Anti-NaV1.6 Antibody (#ASC-009). A. NaV1.6 staining (red) is strongly detected in knobs (arrows) and somata (brackets). NaV1.6 expression intensity declines from basal to apical extremities. B. Lack of immunostaining is observed when the antibody is preincubated with the control antigen. Adapted from Bolz, F. et al. (2017) Front Neuroanat. doi: 10.3389/fnana.2017.00028. with permission of Frontiers in Neuroanatomy.